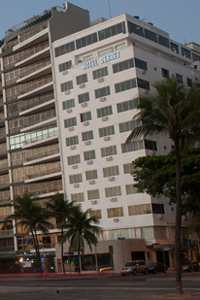 Since opening in 2001, the JW Marriot Rio has been considered a landmark in Rio de Janeiro. Located in front of Copacabana Beach, and only 24 km from the International airport and 12 km from the domestic airport, the JW Marriot is close to stores, shopping centers, restaurants, and night life hot spots. The hotel has 245 rooms specifically designed for those traveling for business. All rooms feature two-line telephones, speaker phone, voicemail, high speed internet access, cable/satellite TV, newspaper delivery from Monday to Friday, mini-bar, coffee machine, individual climate control, iron and ironing board, hairdryer, and safe. Also available for the guests use is an outside pool, fitness center, sauna, massage room, and beach service. On July 01, the hotel starts to apply the law against smoking in all hotel and will no longer have apartments available for smokers. Smoking will be allowed only in outside areas of the hotel. Disobey the law and smoking inside the apartments or inside the hotel, will be punishable by a fine. When would you like to stay at JW Marriott Rio Hotel ? 1) Rates at the JW Marriott Rio Hotel may not be valid during Carnival, New Years, Easter and other special dates.